Bethesda and Dire Wolf Digital have shaken up the usual CCG formula with fresh ideas and new spins on old concepts. Plenty of game creators and developers have tried to make it big by producing their own spin on the collectible card game, be it in the real world or in digital realms. Blizzard's Hearthstone quickly rose to be a multi-million dollar title, breaking the genre into the limelight and introducing card battling to players who are probably more comfortable playing games on a screen than on a table. Such is the appeal of The Elder Scrolls: Legends, Bethesda's take on the genre and the latest and greatest CCG to hit the market. 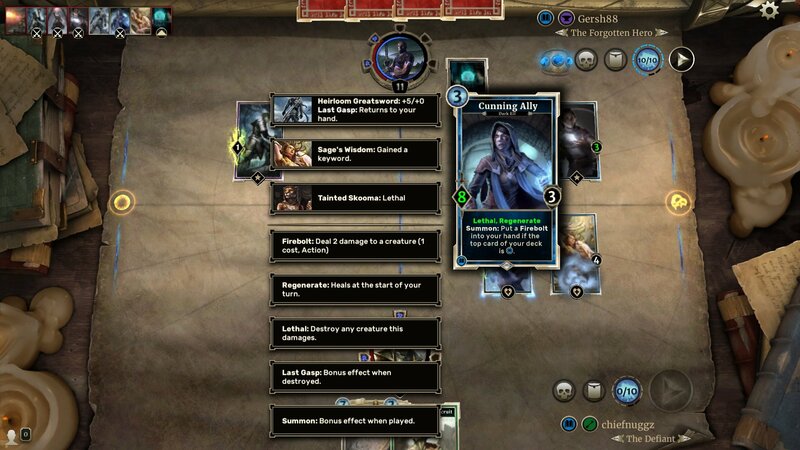 Tapping on the rich gameplay inherent to card games and backed by the extensive lore of the Elder Scrolls series, Legends appeals to both casual CCG fans and fervent Elder Scrolls followers. The game has been out in beta form for some time, which provided an ample window in which players could acclimate themselves to the title's unique charms, and now it's made its formal debut on PC and iPad. So how does the Legends stack up in the CCG arena? Does the mobile version run as well as players would hope? Is the game worth players' time or even their hard-earned dollars? Read on to find out. It's difficult to describe The Elder Scrolls: Legends without referencing other popular CCG titles, so for convenience, we'll make comparisons. Like in Magic the Gathering or Hearthstone, the bulk of the game sees players facing off from across a tabletop using decks of their own creation. Like with Magic, Legends employs a color-based alignment system that serves in a way to denote player classes. Each of the six colors is tied to an alignment, and alignments run the gamut from Strength to Endurance or Intelligence. Players can only use cards from two of these distinct alignments for any given deck, although the grey-colored neutral cards can be used to fill in gaps wherever players choose. 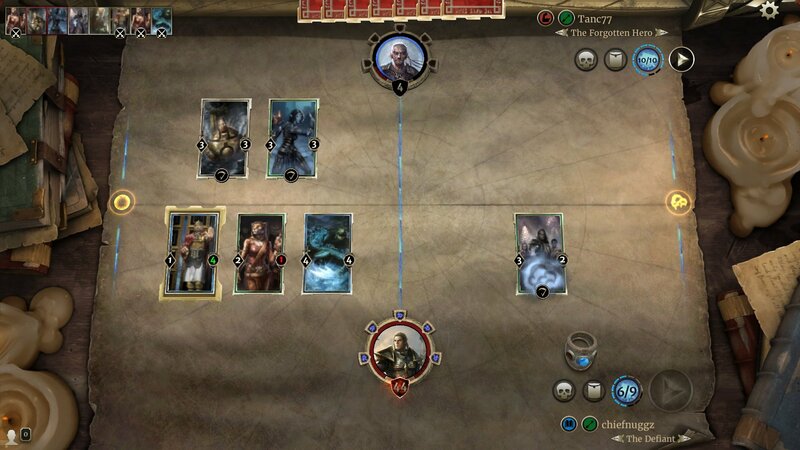 On the gameplay end, bouts within Legends play out in a manner very similar to Hearthstone: players each start with 30 hit points and one point of magicka, the resource used to summon cards. A player's max magicka increases by one on each of their turns, allowing them to summon more cards or more costly cards at their discretion. Moreover, cards fall into four basic categories: creatures, which can deal or absorb damage; abilities, which may deal damage, bestow buffs, or both; items, which are essentially buffs; and supports, which provided limited-use abilities or ongoing battlefield effects. Sitting atop the mix are keyword abilities, which act as powerful modifiers for various cards. Some cards have their own keywords, while some cards and abilities can bestow keywords onto other cards. Keywords can completely change the utility of a card, with keyword abilities like Regenerate restoring a card's health at the beginning of a player's turn, or Charge allowing cards to attack on the round in which they're drawn. The biggest change that Legends makes to the usual CCG formula is the game's use of lanes. Nearly all matches within Legends feature two distinct lanes: a normal lane on the left and a Shadow lane on the right. The lane distinction means players have to stay consistently focused on both offense and defense, as a lane might be empty in one round and full of cards in the next. The right or Shadow lane in particular makes for an interesting dynamic, as all cards played to that lane receive cover for the turn after they're played. This means that smart players can queue up an attack largely without worry that their opponent will simply wipe those cards out on the next turn. Beyond the overt use of lanes, Legends also employs a rune system. At the start of each round, both players have five runes attached to their health bars. Each time a player takes five damage — or, more accurately, each time a player's health reaches 25, 20, 15, 10, or 5 — that player draws a card. Moreover, cards with the Prophecy keyword ability that are drawn through rune loss are able to be played immediately, for free, right in the middle of the enemy player's turn. This makes for an added layer of strategy, as players drawing a Prophecy card from rune loss can easily strike down the next most powerful card set to attack, or even get the ball rolling on an offensive they'd been waiting to spring. The depth within The Elder Scrolls: Legends' gameplay is pretty stunning, providing scores of options for players keen on climbing up the game's ranking system. For others — particularly more single-player minded gamers — things don't feel quite as robust. The game does have its own campaign mode, and as of last Wednesday an all-new campaign expansion called The Fall of the Dark Brotherhood, but despite the story mode's length, there isn't too much meat to be found. Some matches have unique qualifiers, like 1 damage bottles being thrown at a random unit each round in bar brawl, but by and large matches against computer-controlled opponents just aren't as satisfying as those against players. In Legends, victory is never assured. On the flip side, matches against human players can sometimes be frustrating. There's always going to be a gulf in skill between two players of any given game, but losing in Legends is made all the more frustrating based on matchmaking that ignores individual players' levels. In the dozen or so hours I've spent playing I was frequently matched up against players in both casual and ranked matches that had cards I simply hadn't gained access to yet. Sure, matching opponents with better cards is inherent to CCGs, but seeing odd balance quirks like that within a video game feels a bit like an oversight. 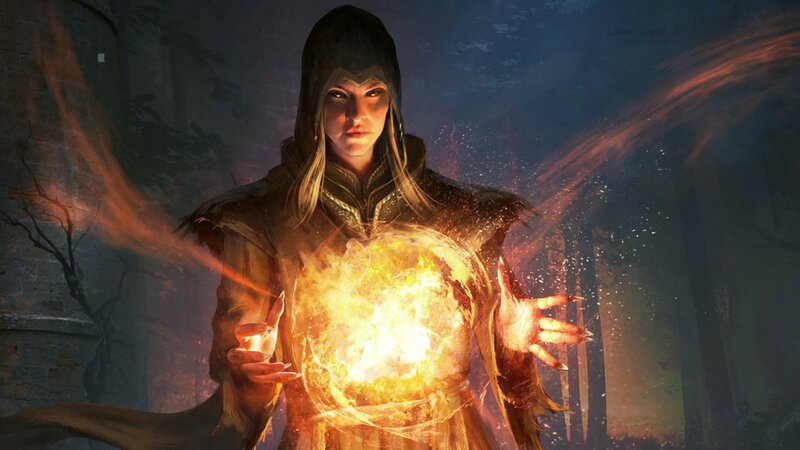 In the grand scope of things, the few issues to be found within The Elder Scrolls: Legends are just trifles. The game has plenty to offer players of all preferences, and each victory or level up carries with it rewards of new cards or evolutions of old cards, gold coins that can be used to buy entry into the game's Arena, or Soul Gems that can be used to craft cards players haven't yet acquired. Even better, the game can be enjoyed for hours on end or potentially infinitely without spending any real-world money. With that said, players can opt to buy their way into the Arena ($1.99) or buy card packs ($2.99 for two packs and up to $69.99 for 60 packs with added Legendary cards) if they so choose. There's so much to love within The Elder Scrolls: Legends. It's not often that players are treated to a free-to-play game that's truly free and representative of the AAA quality fans have come to expect from the Elder Scrolls series. It even runs well on mobile devices, with no noticable slowdown or serious omissions to be found within the iPad version of the game. All in all, it's an excellent title to pick up, even for players who are new to collectible or computer card games. The only real excuse not to check out The Elder Scrolls: Legends is never having heard of it, and as time goes on, even that excuse will soon disappear. Looking for a low- or no-cost gaming fix beyond The Elder Scrolls: Legends? Then check out our list of the Best Free To Play Games.